Bhubaneswar: Regional Institute of Planning, Applied Economics & Statistics (RIPAE&S), has its genesis in the erstwhile Statistical Training Institute (STI), which was established in the year 1970 and started functioning in a rented house at Goutam Nagar in Bhubaneswar. It was shifted to its own campus in A/65, Nayapalli, in the central location of Bhubaneswar in the year 1987. Realizing the importance of training for Human Resource Development, in the field of statistics, economics and planning, Government in Planning and Convergence Department rechristened it as Regional Institute of Planning, Applied Economics and Statistics in the year 1996 with a view to developing it as a Centre of Excellence in the field of Planning, Applied Economics and Statistics in eastern region of the country. 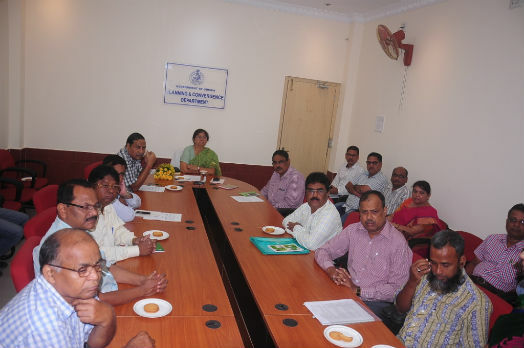 However, it continued to have the status of the head of office under Directorate of Economics and Statistics, Odisha. On December 2016, RIPAE&S was conferred with the Status of Heads of Department. RIPAE&S has developed its website www.ripaesodisha.nic.in with the technical support of National Informatic Centre, Odisha, Bhubaneswar. The uniqueness of the website is the integrated application of Online Training Monitoring System. The purpose is to digitize the entire process of training system of RIPAE&S. This website was inaugurated by Smt. Usha Devi, Hon’ble Minister, Planning and Convergence, Odisha. N.K. Nayak, Officer on Special Duty. P & C Department, Sri G.B. Reddy. OSD and Special Secretary, P & C. Department, Sri G.B. Reddy, OSD and Special Secretary, P & C Department, Sri D. Behera, Director, Economics and Statistics, Sri K.D. Sahoo, Director, RIPAE&S, Smt. Nirupama Mohapatra, Director (Technical), NIC Bhubaneswar and senior officers from P & C Department, Directorate of Economics & Statistics and RIPAE&S were present during the inaugural ceremony.